Rachel graduated from Simon Fraser University in 2017 with a BSc in Earth Sciences. During her undergraduate degree she had the opportunity to work with the Physical Volcanology research group as a research assistant. 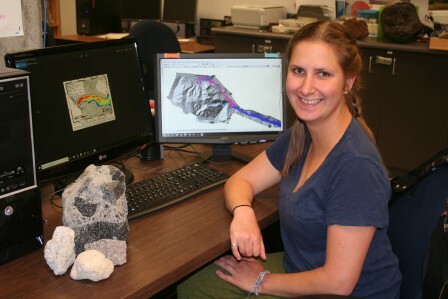 Her work involved assisting in the research and field work at Tseax Volcano in British Columbia. This is the site of one of Canada's most recent volcanic eruptions which was one of the deadliest natural disasters in Canadian history. With a keen interest in furthering Canadian Volcanology research, Rachel began her MSc in September 2017 under the supervision of Dr. Glyn Williams-Jones as part of the Centre for Natural Hazards Research at Simon Fraser University. She is excited to be working on developing a volcanic hazard assessment for the Mt. Meager Volcanic Complex, the first of its kind for any Canadian volcano. Mt. Meager is a remote volcanic system that is currently in a state of quiescence. However, it is a site of industry and infrastructure investment, making it imperative that stakeholders understand the volcanic hazards associated with this region in the event of any new phase of volcanism. For this project Rachel is identifying those volcanic hazards most likely to be of concern and working with numerical models to simulate the impact footprint for each hazard, in consideration of a variety of conceivable eruption scenarios (varying style and magnitude of eruption). The final deliverable for this project will involve a volcanic hazard map showcasing the impact of each plausible scenario. This will be an important resource for future development plans and consideration of mitigation strategies to protect assets at risk. Furthermore, this project is intended to provide a framework for the development of volcanic hazard assessments for other volcanoes in Canada. Available data is extremely limited for almost all known young volcanoes in Canada. As such, the development of a volcanic hazard assessment for Mt. Meager will act as a case study in developing an effective numerical model based volcanic hazard assessment in a Canadian context.